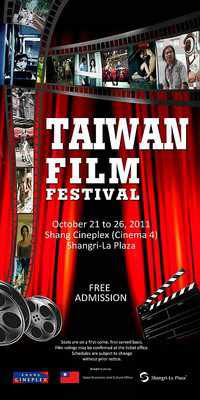 2011 Taiwan Film Festival ~ Philippine Freebies, Promos, Contests and MORE! Film buffs and culture aficionados, there's another exciting movie affair that you will definitely enjoy. Shangri-La Plaza is once again hosting the 2011 Taiwan Film Festival happening this month. A pool of full length films will be featured in this week-long event with movies like Pinoy Sunday, Three Times, Jump! Boys, Gangster Rock, Zoom Hunting and No Puedo Vivir Sin Ti. There are also short and documentary films such as The Magical Washing Machine, Small Station, and Respire. Admission is FREE so rush to Shangri Cineplex Cinema 4 at least one (1) hour early to guarantee your ticket. The film follows two Filipino migrant workers in Taipei (played by Epy Quizon and Bayani Agbayani) who find an abandoned sofa in the street and attempt to bring it back to their dormitory. The film takes an outsider's perspective on Filipino migrant workers, and as such, it often seems a little off the mark when laying out the motivations of its main characters. More intriguing is its larger portrayal of Taiwanese society. The film depicts a people now caught up in the decadence of urban living, failing to notice the invisible and silent class of people that keeps everything running. Quizon and Agbayani recall Laurel and Hardy as they travel across an unforgiving city landscape. The film tells three stories in three time periods. In 1966, a soldier falls in love with a pool hall hostess. In 1911, a prostitute seeks to escape her plight, pinning her hopes on a man of influence. And in present day, a pop singer avoids her female lover to spend more time with her male lover. The segments vary in style and tone, all building towards a theme that explores the smallness of romance in a world rife with conflict. Any film lover would do well to seek this movie out. The film is a documentary following the exploits of a class of young gymnasts and their tough, unforgiving coach. The coach happens to be the director's younger brother, a former rising star in gymnastics whose injuries ended his career and led him into a life of petty crime. The relationship between documentarian and subject is always strange and nebulous. The added connection in the film adds intimacy and sympathy where there would otherwise be judgment. The film takes a pretty serious look at the pressures young people go through in the Taiwanese educational system, but it also somehow manages to be lighthearted and occasionally funny. That’s a pretty amazing achievement. In stark black and white, the film follows a poor man as he tangles with Taiwanese bureaucracy to keep custody of his daughter. The man inevitably gets crushed beneath the machinery of bureaucracy, leading him to become more and more desperate. The film is based on a true story, and it mostly takes its cue from Italian neorealist pictures to present the story in a truthful way. The film occasionally cuts into this effect with slices of melodrama and an intrusive musical score. It comes out a little thin in the end, but in moments, the film does have power. Tells the story of small-time crook who gets put in charge of a shady record company and is tasked to manage a young rock band to stardom. A suspense drama that owes much to Hitchcock's Rear Window, telling the tale of a fashion photographer who inadvertently snaps a picture of a woman having a steamy affair. She and her sister decide to keep tabs on the woman, but what starts out as harmless fun turns out to be something more sinister. Gangster Rock doesn't offer many surprises, but it comes from a fine tradition of comedic Asian gangster pictures. Zoom Hunting is the more intriguing of the two, the film stuffed with twists and turns that ought to leave people guessing. Tells the story of a little girl who encounters a magical washing machine that turns garments either old or new, or keep them dirty; sometimes acquiescing to what one wishes for, and sometimes churning out something completely different. Inspired by a real story, Small Station chronicles the travelogue of a 60-year-old woman and her 35-year-old mentally-disabled son as they journey from Taipei to a remote station in Taiwan; while Respire narrates the sad tale of a young girl who lives in a fictional world transformed by a deadly airborne virus. Knowing that her time is short, the young girl decides to enjoy one last day with the boy she likes. Won awards in Cannes, is set in a future where everyone is forced to wear a mask due to a fatal virus released in the air. Promo Prize: FREE Taiwan Films!